A HUMAN PERSPECTIVE A visit to Gorée Island, off the coast of Senegal, can be a moving experience. This island served as one of the busiest points for exporting slaves during the slave trade. From the mid-1500s to the mid-1800s, Europeans transported about 20 million Africans through Gorée Island. The island has a slave house, a dark, damp building that housed captive Africans. Europeans packed these captives onto slave ships bound for plantations in the Americas. Approximately 20 percent of all Africans died on the transatlantic voyage—and the rest never saw their West African homes or families again. Slavery had a profound effect on West Africa that is still being felt there today. West Africa includes Benin, Burkina Faso, Cape Verde, Chad, Côte d’Ivoire, Gambia, Ghana, Guinea, Guinea-Bissau, Liberia, Mali, Mauritania, Niger, Nigeria, Senegal, Sierra Leone, and Togo. West Africa is a cultural hearth, and its ideas and practices spread to North America and Europe. The empires of Ghana, Mali, and Songhai thrived in West Africa because of their location on trade routes across the Sahara. Gold and salt were the main products traded. 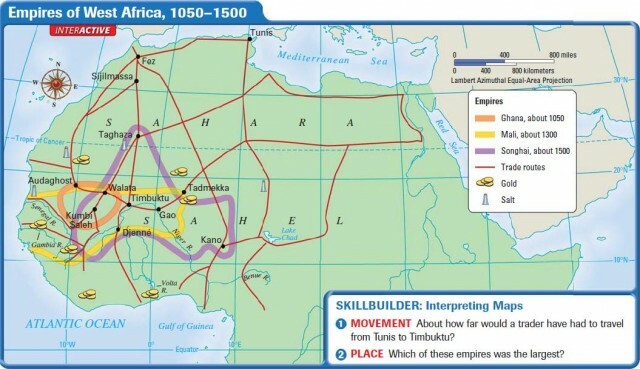 By A.D. 200, trade across the Sahara had existed for many years. Many of the trade routes crossed an area farmed by the Sonike people. They called their leader ghana, or war chief. Traders began to refer to this area as Ghana, which grew rich from taxing the traders who passed through its territory. Traders exchanged mostly gold and salt. Ghana became an empire around A.D. 800 but began to decline in power by the end of the 11th century. By 1235, the kingdom of Mali emerged. Mali’s first great leader, Sundiata, conquered Ghana. He promoted agriculture and reestablished the gold and salt trade. Some experts estimate that until 1350, about two-thirds of the world’s gold came from West Africa. Around 1400, Mali declined because of a lack of leadership and the discovery of new gold fields farther east. Around 1400, the empire of Songhai replaced Mali. Sunni Ali ruled for 28 years, beginning in 1464. In 1591, a Moroccan army invaded Songhai and defeated it, destroying the empire. West Africa is filled with many different cultures and peoples. Before colonialism, some of these people lived in what are called stateless societies. A stateless society is one in which people rely on family lineages to govern themselves, rather than an elected government or a monarch. A lineage is a family or group that has descended from a common ancestor. Members of a stateless society work through their differences to cooperate and share power. One example of a stateless society is the Igbo of southeast Nigeria. Relying on family lineages worked well for the Igbo and other African societies. However, many stateless societies faced challenges from 18thand 19th-century European colonizers, who expected one ruler to govern the society. Trade is as important to West Africa today as it was in the past. The economic well-being of West Africa is based on the sale of its products to industrialized countries in Europe, North America, and Asia. The economies of West Africa range in strength from the relatively solid economy of Ghana to the weak economy of Sierra Leone. Ghana’s economy relies primarily on the export of gold, diamonds, magnesium, and bauxite to the industrialized world. 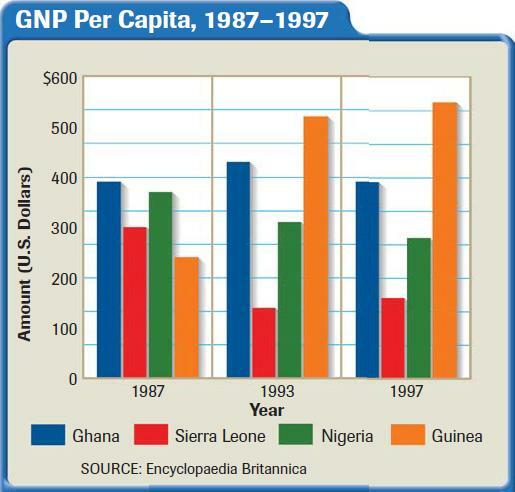 Ghana has a per capita income of $1,900, the second highest in West Africa. However, its per capita income is low compared to the industrialized world. Ghana’s transition from colonialism to democracy has had setbacks, including military rule and civil war. However, in 1992, 1996, and 2000, Ghana held free and fair elections. As a result of this new political stability, the economy is growing at a healthy rate. But other West African countries have not been as fortunate. The worst economic conditions in West Africa exist in Sierra Leone, which once produced some of the world’s highest-quality diamonds. However, years of political instability and civil wars have left the economy in shambles. In addition, a relatively uneducated population—with a 31 percent literacy rate—leaves a shortage of skilled workers. Finally, the road and transportation system contains few highways and only 800 miles of roads. In contrast, Benin, another West African country close to Sierra Leone in size, has about 5,000 miles of roads. West African cultures, such as the Ashanti and Benin, have produced elaborate craftwork and colorful textiles. The Ashanti, who live in what is now Ghana, are known for their work in weaving colorful asasia—what Westerners usually call kente cloth. The designs of kente cloth contain colorful woven geometric figures with specific meanings. Only royalty were allowed to wear kente cloth. Other crafts include making masks and carving wooden stools. An Ashanti stool symbolizes the unity between ancestral spirits and the living members of a family. Fathers often give their sons a stool as their first gift. In the case of kings, the stool represents the unity of the state with its people. The kingdom of Benin, which has no direct connection with the current country of Benin, arose in what is now Nigeria in the 1200s. Benin artists made beautiful objects of metal and terra cotta. However, their most important works were fashioned from brass and are called Benin “bronzes.” They include statues, masks, and jewelry. A common subject of Benin “bronzes” was that of the queen mother. Music is a large part of life in West Africa. West African music has become an important influence on world music. West African popular music involves a blend of traditional African music with American forms of jazz, blues, and reggae—which also had their origins in West Africa because of the slave trade and the contact between the two regions. Over the years,West African musicians used French and English lyrics to attract an international audience. West African music is played on a wide variety of drums and other instruments such as the kora, a cross between a harp and a lute. The kora originated in what is now Guinea-Bissau. King Sunny Adé, also known as the “minister of enjoyment,” is a popular musician from Nigeria. King Sunny and his band, the African Beats, play an informal type of music characterized by tight vocals, complex guitar work, traditional talking drums, percussion instruments, and the pedal steel guitar and accordion.